Visiting Nthabeleng was a major impetus for our family’s trip to the African continent, and we crossed the border from South Africa into Lesotho with anticipation. After months of coordinating with World Vision, gaining security clearance and permission from her family, we were about to meet Nthabeleng, a 13-year old girl we’ve been sponsoring through World Vision since she was 6. Waiting for us on the other side of the border was Julius. He waved to us, and even without his white pickup truck painted with the World Vision logo, we would have recognized him. Friendly and warm, Julius was our contact, translator and tour guide for the next 2 days as we traveled to a rural village in the small, poor and beautiful country of Lesotho. Julius took us to the local World Vision offices where men and women, fluent in English and highly educated, gave us a summary of the local community issues (including AIDS, child abuse and farming). We toured the area, finally arriving at Nthabeleng’s school. No desks, only benches, furnished the private middle school where at least 50 children watched and waited while we picked Nthabeleng out from the crowd. In the back row, I recognized her. She was tall and one of the older children in the school, dressed in a Navy blue sweatshirt and dark red pants. Nthabeleng shook each of our hands but hugged my daughter, the girl who wrote her the most and was the same age. At the blackboard, my husband held up a world map and showed the children and their teachers where we lived, where they lived and the distance we had traveled. 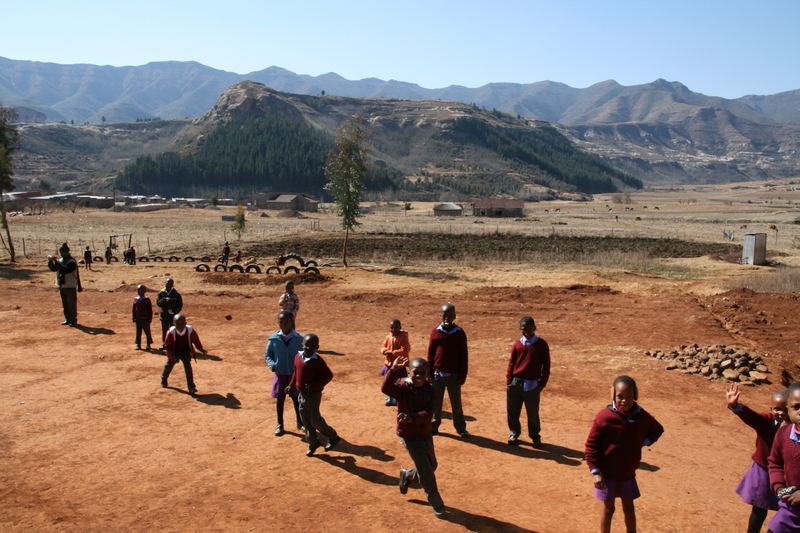 We gave the teachers National Geographic maps to share with their students then left the school with Nthabeleng, waving to children playing on tires buried in the sand. Off the paved road, Julius drove us up the hill to Nthabeleng’s village of red dirt, round thatched roof huts and square brick buildings. As we opened the car doors, we were welcomed by an unusual sound. Shrill trills, high pitched tongue rolling singing, celebrated our arrival. The people of her village escorted us to a table set with their finest, where we sat and ate with entertainment in front of us and the mountains a dramatic backdrop behind us. 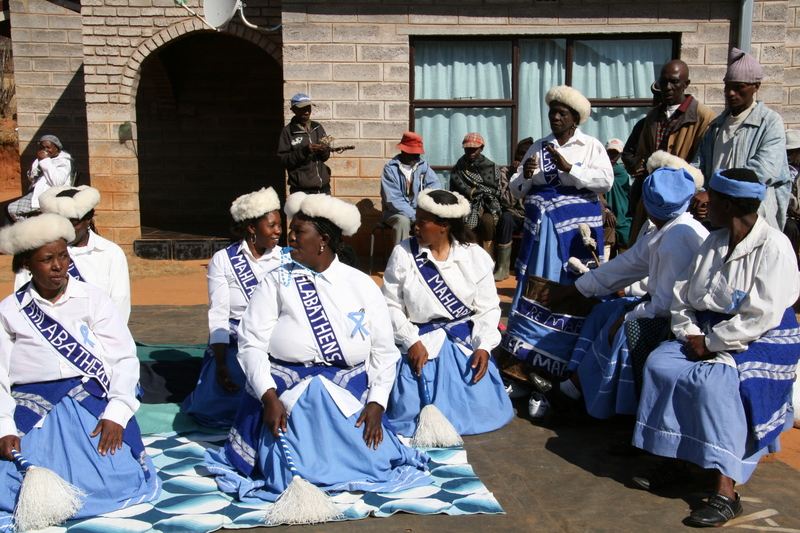 Women dressed in blue and white danced, shoulders rolling and shrugging, while others sang to the beat of a drum. 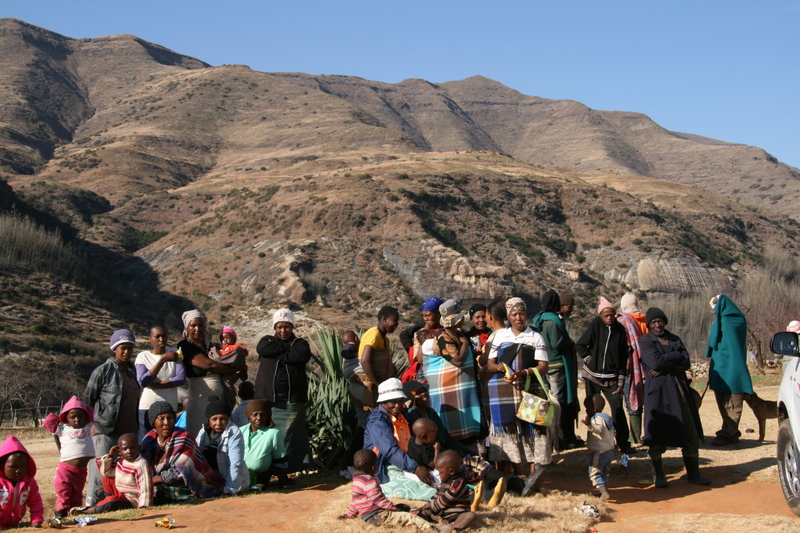 We met Nthabeleng’s family, her mother and sister and brother (her father was off working in the mines); we ate a variety of local dishes and exchanged gifts while at least 70 villagers of all ages looked on. 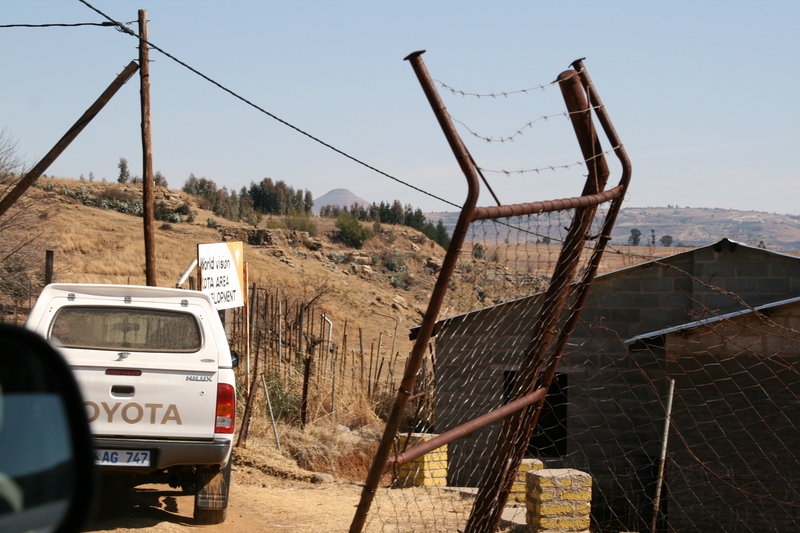 They waved as we left, smiling and singing and shrilling, and we waved back, happy and sad, knowing we’d never see them again, but richer for the experience and wondering what our next day in Lesotho would bring.